A 6.3 Earthquake Struck New Britain, Papua New Guinea (PNG). | Chaos Sweeps Away the World We Know! The Disaster, current events & Catastrophe Blog. Forecasts for 2014 to 2022. Read tomorrows news today! Plus current economic, commodities, stock indices and financial news. ← Chile’s Mount Puyehue Volcano Roars Back to Life! October 18, 2011 – Another Strong Earthquake Struck New Britain, PNG: The region around PNG, The Solomon Islands, Tonga, Samoa and Fiji (in the Pacific South-West) has been the sight of numerous strong earthquakes. The period from 1973 to 2011 saw 346 earthquakes of magnitude 7.0 or stronger; globally. 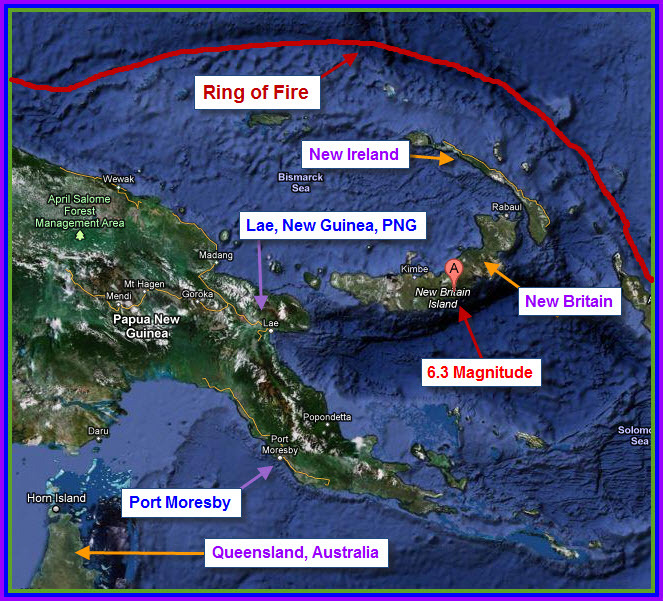 Over 40% of those very strong quakes occurred in the Pacific south-west, near the “Ring of Fire” (see map). Today’s quake struck at a depth of 9 Kilometers (6 miles). Only mild structural damage is expected. No tsunami is forecast, because the tremor occurred on land. It was 3:05PM at the epicenter. It was 1:05AM in New York, 12:05AM in Chicago, 11:05PM (Oct. 17th) in Denver and 10:05PM in Los Angeles. The tremor struck 103 miles ENE of Kandrian, New Britain, PNG; 141 miles south-west of Rabaul, New Britain, PNG; 230 miles south of Kavieng, New Ireland, PNG; 281 miles ENE of Lae, New Guinea, PNG; and 359 miles north-east of Port Moresby, New Guinea, PNG. This entry was posted in American Samoa, Australia, Earthquake, Events, Fiji, Indonesia, Misc, Miscellaneous, Nature, New Caledonia, New Zealand, Pacific Ocean, Papua New Guinea, Papua New Guinea, Ring of Fire, Samoa, South Pacific Ocean, The Kingdom of Tonga, The Solomom Islands and tagged 6.3 earthquake in the south-west pacific october 18 2011, american samoa, fiji, kandrian new britain papua new guinea, kavieng new ireland png, lae new buinea png, new britain earthquake october 18 2011, port moresby new guinea png, queensland australia, rabaul new britain png, samao, The Master of Disaster, the solomon islands, tonga. Bookmark the permalink.